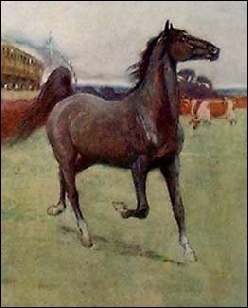 Black Beauty is probably the best known horse book in the English speaking world. It has been published in countless editions, and there can be few horse people who have not read it. Anna Sewell wrote it as a blast across the bows of Victorian lack of sensitivity to animals. Possibly as part of the view that man had been placed by God in mastery over the creatures of the earth, and in some cases poverty so grinding there was nothing to spare for anyone, let alone a horse, cruelty was commonplace. Anna Sewell looked to enlighten people’s ignorance. If you were wealthy enough to employ coachmen and grooms, it was perhaps easy to take no direct role in their care, and to have no idea of how restrictive and cruel a tight bearing rein could be, or to care only for fashion (is the fashion for toting small dogs round in clothes by various celebrities part of the same thing, I wonder?) By allowing the horse to tell its own story, Anna Sewell allows it to speak directly to its tormentors. The book has, since its first publication, gone through many, many editions. This section of the website is not aiming to feature them all; just the most notable (and yes, whatever else happens to swim across my ken!) 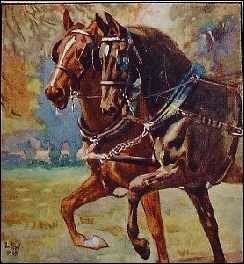 For most notable equine illustrators, doing Black Beauty was something of a rite of passage. Many of them have, including Cecil Aldin and Lionel Edwards; perhaps most notably Lucy Kemp-Welch (the illustration to the top right of this page) as well as more recent illustrators like Sheila Rose. 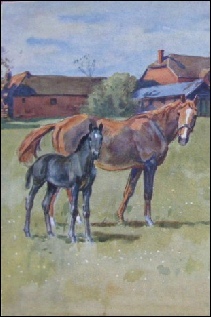 Black Beauty has reflected design fashions: I particularly like two I was given recently, the 1899 printing which has a wonderful floral design absolutely nothing whatsoever to do with the book, and the spare art deco lines of the Alice B Woodward version. If you have any other printings you’d like to let me know about, please do. I’m also looking for bibliographical information about other editions. I do have more editions lurking on my shelves, and will add them at some point.